Scoot those burgers over on the grill this weekend and make room for the shark, tuna and swordfish. The three fish are hearty enough to support the full flavored-robust seasonings laid on by The Early Show resident chef Bobby Flay. He says grilling the fishes is simple because they can handle big flavors and also won't fall apart on the grill — making party planning very easy for the home cook. 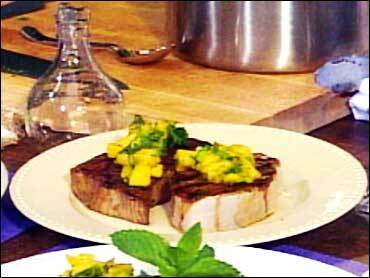 Flay says tuna steaks, swordfish steaks and shark steaks hold up to the pressures of the grill. Each have a bland flavor alone, but taste flavorful combined in jerk rub, says Flay, because the rub awakens the flavors of the fish in a most delightful manner. Place vinegar and sugar in a medium non-reactive saucepan and cook over medium-high heat until the sugar is completely melted and the mixture is reduced by 3/4 and thick . Carefully transfer the mixture to a blender and add the habanero and mint and blend until smooth. Season with salt Let the glaze cool to room temperature. Preheat grill to medium-high or heat grill pan over medium-high heat. Rub one side of each steak with 1 tablespoon of the jerk rub and drizzle with canola oil. Grill, rub-side down for 2 to 3 minutes or until golden brown, brush with some of the haberno-mint glaze and turn the swordfish over and continue grilling for 3 to 4 minutes for medium-well doneness. Brush with more of the glaze and serve immediately.